A safer alternative to votive candles, the Submersible Floralyte II is the perfect way to add subtle lighting to any special event or function. Whether indoors for an intimate dinner or outdoors for a seasonal garden party, these versatile little lights add that special touch that brings any setting together. There are numerous ways to put these lights to use when decorating for any occasion. One way to use Submersible Floralytes is to create pools of glowing water. Just fill decorative jars, bowls, vases or any other container of choice with water and simply add a few Floralytes or go a step further and add flower petals to create the illusion that they are floating over a soft glow. A variation of this idea is to add Submersible Floralytes to a fountain or Koi pond for a more natural, soothing effect. The Submersible Floralyte II is also perfect for stringing and hanging. Use a piece of ribbon or wire to thread the lights and tie beads, silk flowers or other items at varying intervals. Then hang it from trees, weave it through a trellis, or drape it around tables or chairs. Another creative idea is to use Submersible Floralytes in a centerpiece. 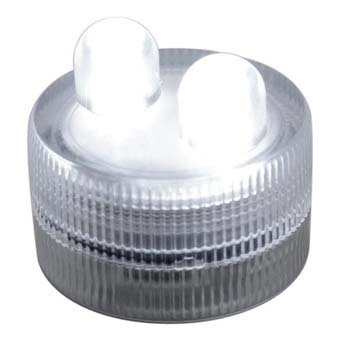 Use a large translucent glass or plastic container to hold a layer of two to four lights. Fill the container with floral marbles, add silk plants or flowers and finish with a lavish ribbon. While Submersible Floralytes, can be a great way to add some light to a special gathering, they can also be used as a staple in the decor of any home. Below are some ideas to help anyone incorporate them into their room makeover or interior design plans. A simple way to dress up a room is by adding a basket of lit trinkets. Start with a basket of any size. Fill the basket with decorative soaps, potpourri, seashells, or floral marbles, or other items of choice. Insert a floralyte in the center and arrange the other items to camouflage its edges. Other floralytes can be added for more of a glow, if desired. Position the basket in the corner of any counter or atop a shelf. Another way to add a fresh look to the room is by using floralytes to adorn the walls. This can be achieved by stringing the lights on wire, ribbon or nylon string and using small nails or tacks to secure them or by merely applying double stick tape to the back of the floralyte and arranging them along the wall. This is also an elegant and functional addition to any stairway banister, entryway or dark hallway. To add a soft light to mirrors or headboards, situate the desired number of floralytes around the outer edges. This is an inexpensive modification that revamps old items quickly and easily. Another unique decorating idea for these tiny lights is to suspend some of them just a few inches from the ceiling. This trick creates the illusion of small, floating orbs of light. Hang them independently from nylon string or tie a few together. Looking for a way to make the dinner table more appealing? Use votive holders to house floralytes and place them at each person's place setting or at random intervals around the table or down its center. The softer lighting creates warm, inviting setting and makes meal time more enjoyable. These are only a few examples of how to integrate the Submersible Floralyte II into home and event decor. With a little creativity there is no end to the inspiration and beauty these little lights can add to everyday things.